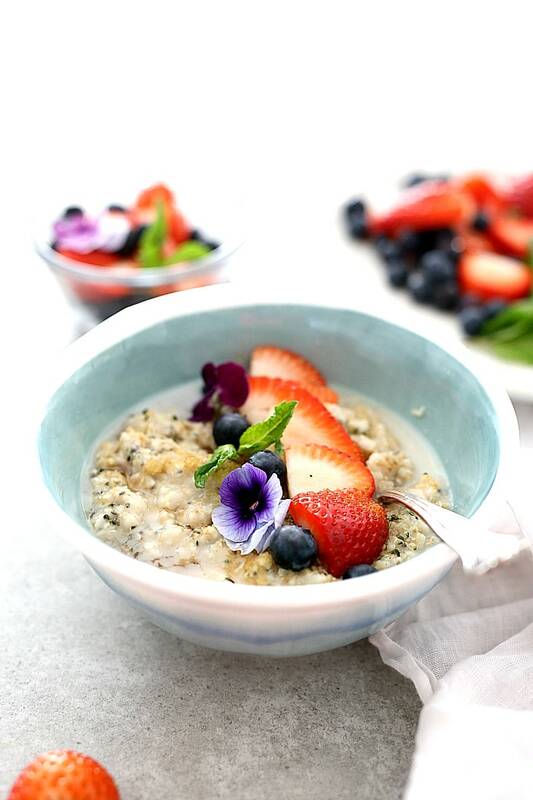 Start the morning fueled and energized with this superfood hemp and chia seed oatmeal bowl! It is packed naturally with fiber, protein and omega’s that will make you feel alert, balanced and full! 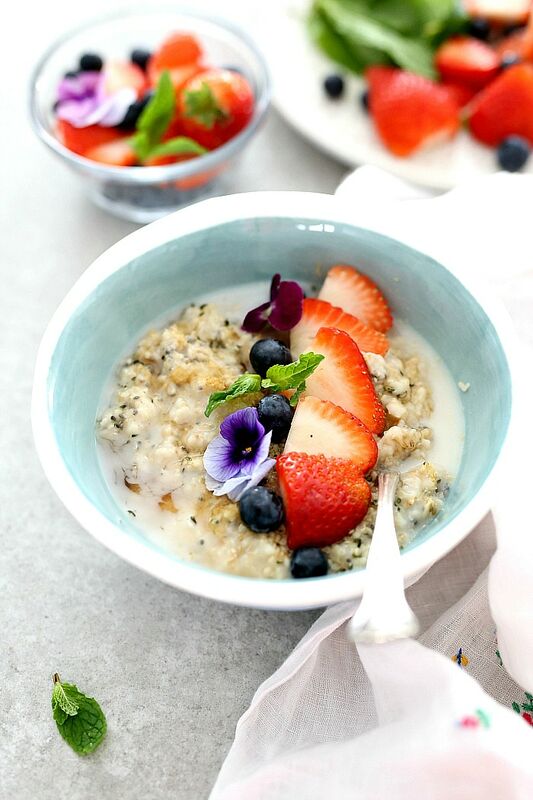 Chia seed oatmeal with hemp hearts, flax meal and plant-based milk is the ultimate powerhouse breakfast bowl (aside from scrumptious smoothies). 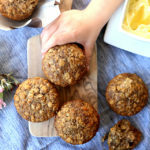 It can be made vegan and gluten free by adding gluten free rolled oats, quick cook oats or steel cut oats and almond milk. My kids love to eat oats. Plain Jane oats straight out of a bowl scooped with a spoon. This is one of their favorite afternoon snack requests. This is what happens though, it gets super messy and the tiny little grains end up all over the floor, table chairs and some home trail throughout the whole house. So I have my boys transform them into these bowl-licking-good hemp, flax and chia seed oatmeal bowls for breakfast and snacks. This hearty whole grain oatmeal is nourishing, and unbelievable good! We usually top our oatmeal with fresh fruit such as strawberries and blueberries (my boys like it pretty plain and simple most of the time). In addition to fruit, I like to add nuts or seeds and almond butter on mine with a dab of non-fat Greek yogurt swirled into the mix. You can extend that farther like this oatmeal recipe by adding bananas and pecans, cinnamon, raisins and/or seeds and your favorite seasonal fresh fruit. 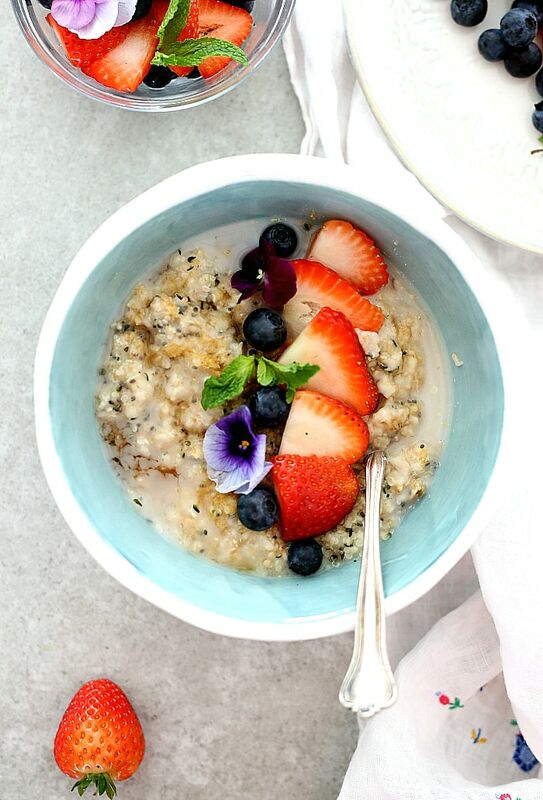 What’s inside these chia seed oatmeal bowls? Quick cook oats, flax meal, hemp seeds (or hemp hearts), chia seeds, maple syrup, water (for cooking), almond milk and a dash of salt. Believe me you will want to add a dash of salt. It brings out all the flavor and makes a big difference! For extra healthy fats and protein, add a drizzle of rich and creamy almond butter – yumm! 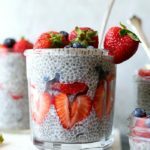 What is all the hype about hemp hearts and chia seeds? Hemp seeds are considered a superfood and are rich in protein, fiber, and healthy fatty acids including omega-3’s and omega-6’s. 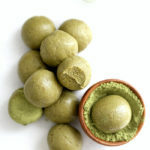 They are also high in antioxidants which can improve the hair, nails and skin and clear the body of free radicals. Free radicals are what damage cells and eating protein and antioxidants helps to repair that damage. Good-bye wrinkles! Chia seeds have a large amount of nutrients in them and are low in calories (yes! love low calorie foods!). Benefits of chia seeds for kids and adults include them being rich in fiber, low in carbs, high in protein and loaded with antioxidants (again bye-bye free radicals!). Chia seeds are an excellent substitute for protein for those that do not eat meat. 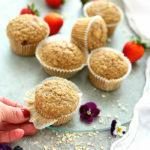 Not only are the hemp seeds and chia seeds nutritional, oats are also high in fiber and may aid to reduce cholesterol. Flax meal also contains a good amount of omega-3’s and may reduce the risk of cancers. Convinced yet how awesome this superfood breakfast bowl is yet? Add to pretty much everything! Can I turn this oatmeal recipe into overnight oats? Yes, you sure can! Turn it into overnight oats by adding the ingredients into a to-go container or mason jar with a splash of almond milk. Cover it and let it set overnight. 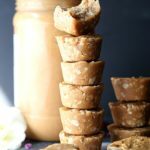 In the morning add a splash more of almond milk (if needed) to make it creamier and your fresh fruit, nuts or nut butters. 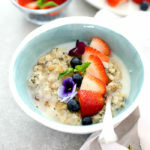 To round it up, all I can say is you will love how quickly it is to make this healthy breakfast and you need this hemp and chia seed oatmeal bowl in your morning routine! Because high fiber foods help with weight management, cleaning out the gut and stabilizing blood sugar levels. 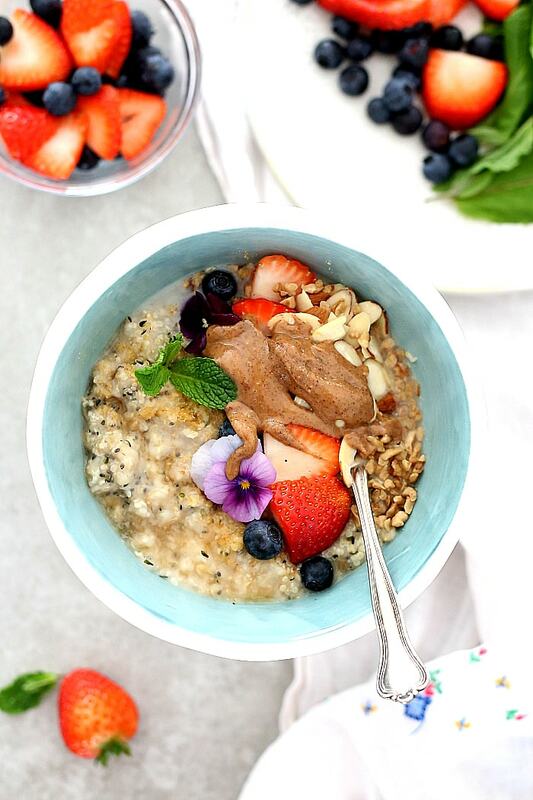 This oatmeal bowl is packed with plant based protein and antioxidants to also aid in reversing the effects of damaged cells. An excellent way to start each morning! 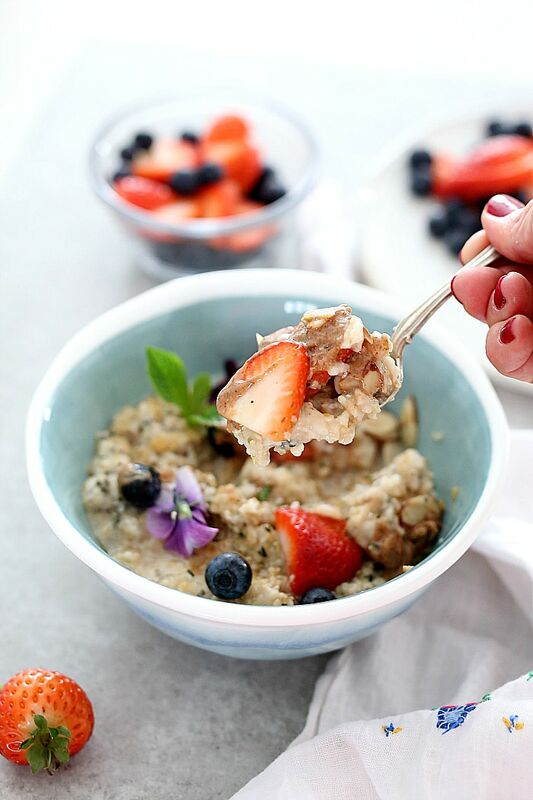 Start the morning fueled and energized with this superfood hemp and chia seed oatmeal bowl! It is packed naturally with fiber, protein and omega’s that will make you feel alert, balanced and full! This bowl serves 1-2 people. Rinse and chop any fresh fruit. Set aside. Boil water and add the oats. Cook about 1 minute over medium heat, stirring occasionally. Combine water and oats in a medium microwaveable bowl. Microwave 1 1/2 to 2 minutes. Add flax meal, chia seeds, hemp seeds, maple syrup, a dash of salt and up to 1/4 cup almond milk (depending how "soup-like" you like it). Mix well. Top with favorite toppings such as fresh fruit, nuts, and almond butter. This post contains affiliate links, which means if you purchase from one of them I receive commission- so thank you because it helps keeps this website going.